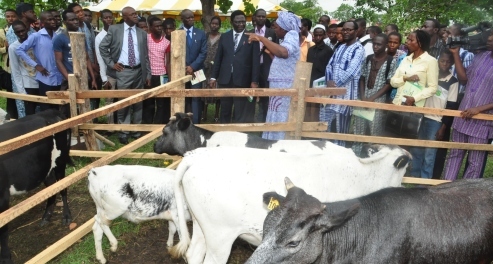 The President of the Federal Republic of Nigeria and Visitor to the Federal University of Agriculture, Abeokuta, Dr. Goodluck Ebele Jonathan, has expressed the determination of his administration to restore agriculture to its pride of place, as a major export-earner for the country. President Jonathan disclosed this through his speech, delivered at the 20th Convocation Ceremony of the University. The President, who was represented by the Minister of Education, Prof. (Mrs.) Ruqayyatu Ahmed Rufa’i, said government plans to increase incentives to farmers and the private sector operators, as about 3.5 million jobs in the agricultural sector alone would be created, by 2015. The move, according to the Visitor, forms part of the holistic efforts of government at diversifying the nation’s revenue base from over-dependence on oil and gas to the labour-intensive sectors, principal of which is agriculture. President Jonathan pointed out that, “The present global reality demands that Nigeria continues to diversify her economy with agriculture as the core driver”. He revealed that the Federal Government was putting in place an initiative to enable the three existing Universities of Agriculture in the country to establish Departments of Technology Transfer and Acquisition, in their curricula. The President said, when established, the Departments would be expected to facilitate the development of appropriate technologies for eventual transfer to the nation’s farming communities, which accounted for about 85 per cent of the nation’s population. Dr. Jonathan commended the initiative of FUNAAB at diversifying its curricula, while retaining agriculture as its flagship programme, noting that it was in line with the Federal Government’s plan to re-engineer the nation’s education sector towards ensuring unrestricted access to education and thereby repositioning it as a potent tool for national development. Delivering his address at the occasion, the University’s Chancellor and Asagba of Asaba, HRM, Obi (Prof.) Chike Edozie, lauded the outgoing Vice-Chancellor, Professor Oluwafemi Olaiya Balogun, whose tenure formally comes to an end on May 23, 2012 for the monumental achievements recorded under his leadership. The Chancellor reiterated some of such achievements to include the transformation of the University into a Poly-academic Institution, the University’s stable academic calendar as well as its ranking as the Second Best University in Nigeria and 35th in Africa. The Asagba,who lamented the fact that no Nigerian University was on the list of the best 1,000 Universities in the world, called on the Federal Government and other stakeholders to do everything possible to ensure that Universities in Nigeria can compete favourably with their counterparts in the world.